"For all you Suzanne Kasler fans . . . "
I just found a great, fun, and insightful interview with Suzanne by SF antique dealer and blogger Buzz Kaplan . . .
and repeat after Coco Chanel . . .
". . . An interior is the natural projection of the soul." I hope everyone has great plans for the weekend. "Coco avant Chanel" opens here in the US on September 25th. Click here for the international release dates. "At first sight . 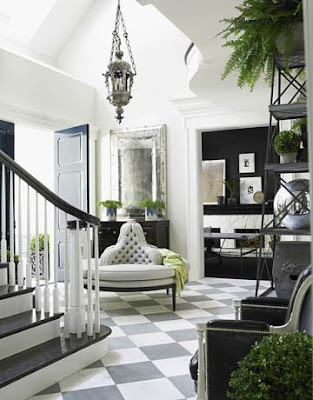 . . "
I think it's a well known fact that I love a good entrance hall . 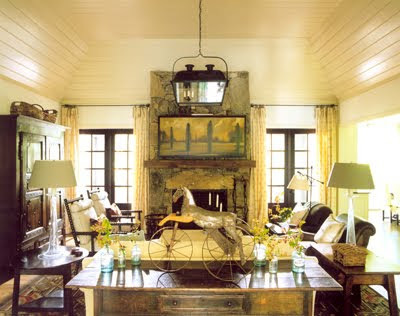 . . and this wonderful space, from the LA designer Windsor Smith, in the new House Beautiful is a new favourite. Great elegance. Beautiful, simple colours. Dramatic architecture. And a lantern! 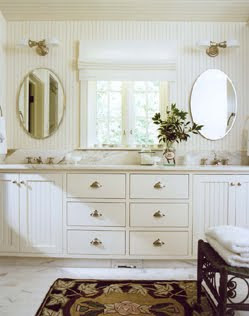 for the complete article from House Beautiful. "The 'Loft,' less modern . . . "
I can still remember the first time I met her. It was the early summer of 1988 and I had flown to San Francisco to interview for a position with Ralph Lauren. I had walked into the shop looking for the gentlemen with whom I had scheduled the meeting and this wondrously glamorous lady, in these amazingly beautiful shoes, informed me that things were running a tiny bit late, but that he would be right with me. That chic, stylish lady - in the 4 inch chocolate crocodile heels - was Cathy Post. And we have had the opportunity of working together through both of our careers with Polo over the last 20 years. 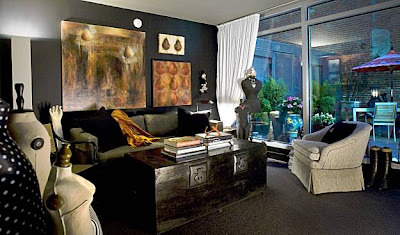 Cathy - now the general manager for the Polo Ralph Lauren store in downtown San Francisco - had her wonderful loft apartment, in the South Beach district, featured recently in the SF Chronicle. 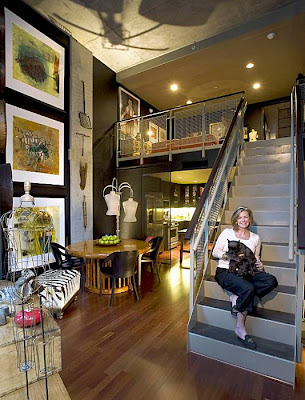 I was delighted to see her fresh, comfortable 'take' on the expected loft living 'south of market' street. Concrete, yes. Steel, yes - but with lush velvets, Asian furniture, French antiques, and whimsical accessories to keep an interesting balance. cold shrine to modern art, instead is a cozy, chic fortress. John Wheatman to help her pick colors for the walls. She has purchased all sorts of mannequins - from antique French haute couture forms to headless mannequins to a mannequin with a ram's head and marionettes with no heads - in her world travels and at flea market sales, and even from the late I. Magnin store. - "
- When she (Cathy) entertains, she prefers walk-around mixers for several dozen friends to seated dinner parties. Chic, elegant, and interesting. I've always loved Cathy's great style, both in her wardrobe and her home. And it has been such fun seeing how both of our lives, and our styles, have evolved in the years since that first day. The giddy, nervous young man looking for a career. And the chic lady in the crocodile heels. "Simply bragging . 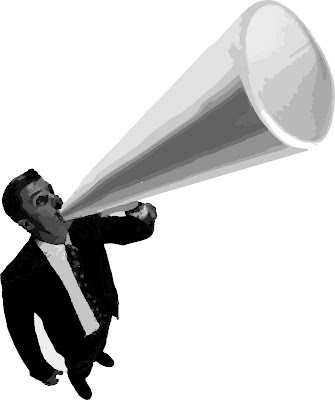 . . "
This is the review of the opera (Dido and Aeneas) that we're performing this weekend. Wow. I've been in tons of productions . . . and you never quite know what it actually looks like from the audience - but, this is one of the best reviews I've ever read from one of our shows. I'm so proud to have been involved in such a great production. "The last line in the program for Urban Opera's Dido and Aeneas, is "If you like what you see, please make it a point to thank them [the performers]." Since I didn't get a chance to do so at the performance's conclusion, I'd like to publicly thank the entire cast, crew and theJubilate Baroque Orchestra for putting on a damn fine show. It's easy to be skeptical about the promise of a small company in a big town, but Urban Opera's first time outing was more successful than it had any right to be. To begin with, staging an opera outdoors is a risky proposition under the best of circumstances. When I woke up this morning and saw the customary summer fog, my thoughts turned to my plans for this evening and a voice in my head said this is going to be a cold and ugly night.Sometime in the early afternoon Zeus decided to smile on this company, and the weather made an about-face so surprising I'm not sure I've ever witnessed one like it in the years I've lived here. The weather was perfect. The setting was fantastic- with the Bay to the left, a green lawn spread before us, complete with a twisting, mirrored sperm-like twisted French Horn (the 70's kind) sculpture somewhat resembling the city of Chicago's "Bean", tall bamboo fronting the buildings framing the space and uncanny acoustics for being outdoors in the City, I walked into the performance space and thought- hmm- this looks pretty promising. But enough of all that- there was opera to be performed, and that was why I was there. The production begins with a voluptuous Venus in a red dress (Margaret Marshall) and a straight-from-the Playa Phoebus (David Peterson) providing a prologue to bring the audience up to date on what happened in Virgil's version of the story before Purcell's opera begins. Following this, during the overture, the chorus and principals perform a ballet/ pantomime of the fall of Troy and the subsequent chaos in an effective yet succinct way. Particularly striking during this was the evident commitment of the cast to actually act- their faces looking stricken and panicked as they fled across the outdoor space. From that moment forward it was easy to fall under the sway of what unfolded before the audience. While the entire cast was solid across the board, Kindra Scharich(Dido), Kimarie Torre (Belinda) and Cortez Mitchell (the 1st Witch) truly stood out with terrific vocal and theatrical performances. Milissa Carey was an alluring and, to put it bluntly, highly enticing Sorceress. Purcell didn't give Aeneas too much to work with, but Todd Wedge brought a sensitivity to the role that worked. The Urban Opera Chorus had some challenging choreography to execute during the evening, which they handled well and their singing was beautiful. So this is the bottom line: I don't know if we'll ever see another production from this team, led by Chip Grant and Kue King, but I hope we do. There is a dedication and imagination on display in this production from every corner that really impressed me. You have two more chances to see it this weekend- so get yourself a ticket. This really is urban opera- and it's something different, sophisticated and well worth your time." From: "The Ambassador Roams High and Low"
"Somewhere that's . . . "
Just reminiscing a little this afternoon and looking forward to another episode of Mad Men on Sunday evening. I can still see my Mom in the early 60's, resplendent in her mod-printed capri pants . . . and smoking . . . while making dinner in our long, galley-styled kitchen when we still lived in Florida. I must have been 4 years old. The 5th Dimension blasting on the huge stereo in the living room. My father pulling up from work in his huge Chevrolet. It seems to me that one of the most compelling aspects of watching Mad Men for me is seeing the amazing work of the set designers . . . my mind easily wandering back to those early years . . . but, because I'm me . . . and my mind wanders easily . . . this is where it landed late this afternoon. If I'm going to have this running through my brain all weekend, then so are you . . . lol. But, it's a favourite from "Little Shop of Horrors." It always brings a little tear to my eye. I guess it shows the impact of shelter magazines . . . lol. And I bet you didn't know there was a big musical number about "Better Homes and Gardens" did you? And, clearly, you should get to hear the big closing number. Just 'cause it's a favourite of mine too. I hope you all have great plans for the weekend. And have found your way to that 'dream house' you've always wished for - no matter what its form. "All the Best - Bedroom contest . . . "
I've just heard such exciting news . 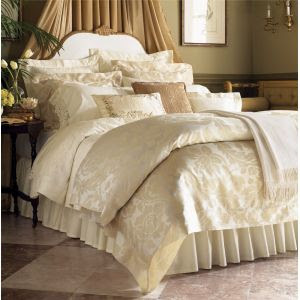 . . my, I love blogging from my bed about bedding (but, that's not the big news - lol) . . . Ronda, over at All the Best, is having a design contest over the next several weeks and is looking for The Best Bedroom. I think it's an amazing chance to have your work featured on one of the best sites in all of the blogosphere. So get out those cameras and start shooting. The judges for the contest are : Ronda Carman, Michael Devine, Amanda Nesbit, Todd Romano, Nathan Turner, Kelly Wearstler, and Vicente Wolf. 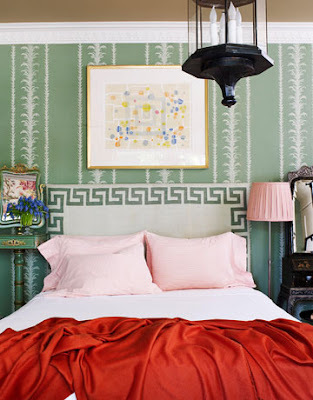 Both interior designers and design enthusiasts have an opportunity to enter the ALL THE BEST BLOG 'Best Bedroom Contest'. Submit clear, unpublished photographs (up to a maximum of ﬁve photos) of one bedroom designed by you to (allthebestcontest@gmail.com). 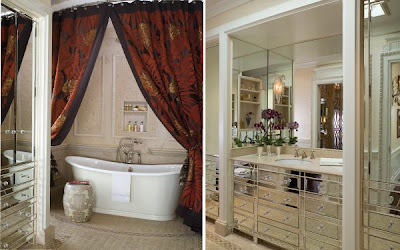 It can be your own personal bedroom or a bedroom designed by you for a client, just as long as it is your OWN work. 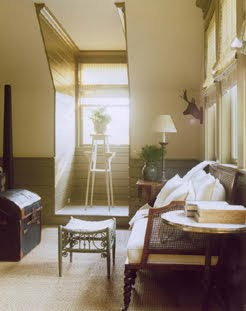 Photograph every angle of the room, including close-ups of the bed and special details. Images should be no larger than 1MB and in jpg format. Provide your full name and address. The grand prize winner will receive a complete set of Celeste Sheets by SFERRA, spun from the ﬁnest Egyptian cotton ($550 value). The second place winner will receive a pure cashmere Dorsey Throw by SFERRA ($400 value). The third place winner will receive a Marquetry Throw by Kelly Wearstler for SFERRA ($255 value). September 25, 2009. Winners will be announced on October 5, 2009. "Craving comfort . . . "
I'm not really *sniff* feeling well this morning. Luckily, I have an easy day - so I think I'll work from home (which may very well include some napping) for most of the day - before zipping into the office for a few meetings later in the afternoon. But, in the meantime, I'm craving some pampering and comfort foods. 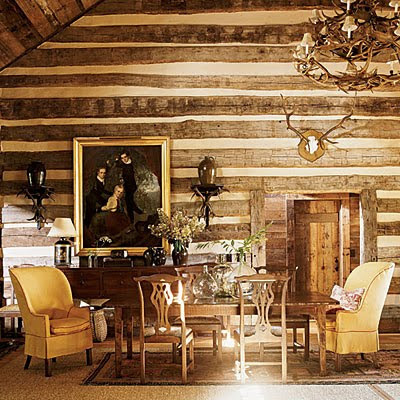 And dreaming of a chic, rustic cabin in the woods. 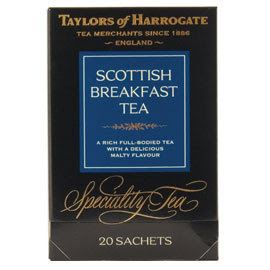 Scottish Breakfast tea and oatmeal w/ almond butter. Warm and yummy. Back to my dream home . 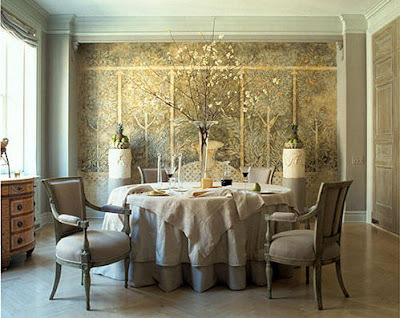 . . the wonderful work of Charleston designer Kathleen H. Rivers. 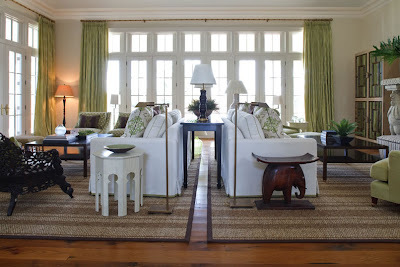 “It’s a huge room that serves many functions,” says designer Kathleen Rivers, “but we didn’t want to fill it up.” When it came to furnishing the house, she says, “comfort was the primary goal.” Inspired by the mellowed, layered look of English country houses, Rivers created a seemingly offhand mix of Southern antiques, tribal rugs, and regional pottery." The perfect place for a warm, comforting lunch later in the day? Please? 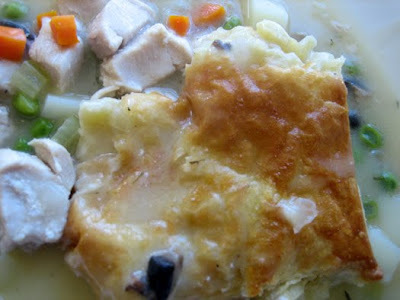 With any luck, there will be some homemade chicken pot pie for lunch. I already have mother's recipe ready to go. And I'm making chicken stock right now. 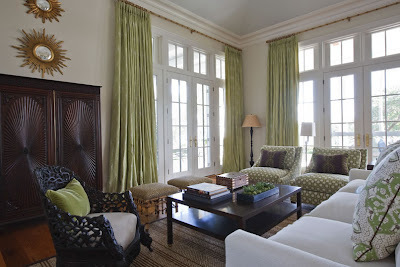 "With its juxtaposition of Southern furniture, wicker armchairs, antique hickory rockers, a Moroccan rug, and a pair of bright green lamps made from vintage tin containers, the porch suggests an earthy informality." And blessedly, Project Runway starts tonight. television watching curled up in bed. for the complete article from Southern Accents. "Let's put on a show . 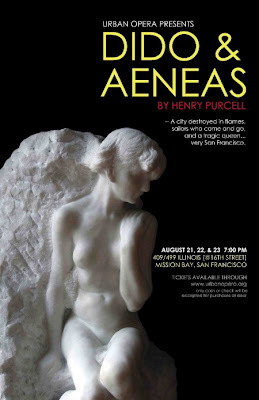 . . "
It seems like we've been working for weeks and weeks in music rehearsals and staging - and now, on Friday evening - we (the members of the SF's new "Urban Opera" company) open with our first performance of Purcell's Dido and Aeneas - out under the evening sky. 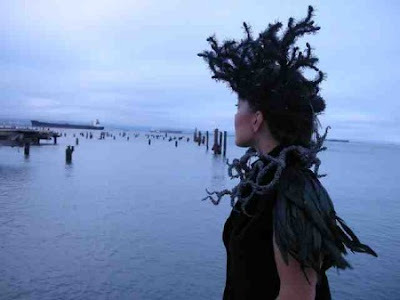 "Urban Opera is a new San Francisco-based opera company focused on telling the beautiful, yet often improbable, stories of the classic operas in a compelling way for a modern audience. Urban Opera sets these tales of passion, betrayal, love and loss in unexpected locations in the City with minimal sets and emerging, talented singers who aren't afraid to take risks -- this is not your grandparents' opera." It's always such a great pleasure working with the amazing musicians here in the Bay Area. And to be part of a new company - it has been so exciting. And yes, we are performing the opera outside with a small orchestra with a cast of about 30. We've got a great story of love, and royalty, and fire, and witches, and evil spells, and thunderstorms, and fickle gods, and clearly, someone might have to die. It will be magical. If you're in the area this weekend - we are performing Friday, Saturday, and Sunday evenings - come out and join us. Click here for additional information and for tickets. and a tragic queen ... very San Francisco"
and repeat after John Saladino . .
" . . . We need space the liberates us from terra firma, allowing our spirits to soar and our imaginations to take flight." "I'm feeling a change in the weather . . . "
Fall in coming, Fall is coming, Fall is coming. Click here for the clear, irrefutable evidence. It should be fairly obvious why I'm loving it. lol. "A Country Weekend . 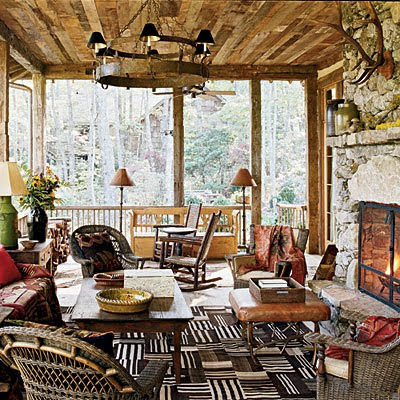 . . "
We all need a quick respite from the busy work week - and this weekend's "getaway" home features a rustic cabin by interior designer Barbara Westbrook on the shores of Lake Keowee. And yet another in a series of lantern light fixtures for me to lust after. 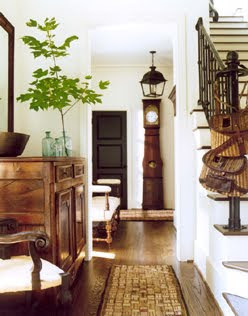 I love the great combination of gracious southern style and classic rustic architecture. 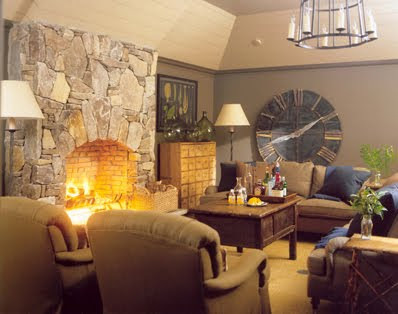 The perfect place for family to gather and tell stories of the past. 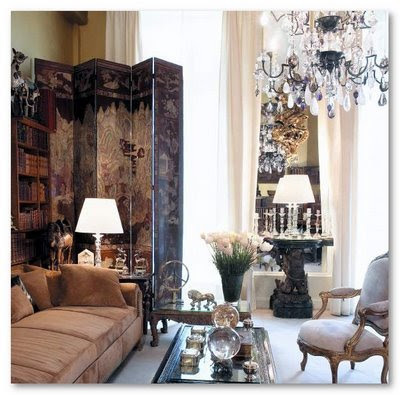 feminine quality to contrast with the massive furnishings and stark colour story. 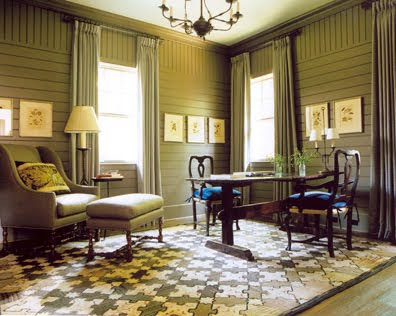 Love the dark rustic rug against the marble and bead board. The perfect place the curl up with a great book. And an evening by the roaring fire to complete our tour. 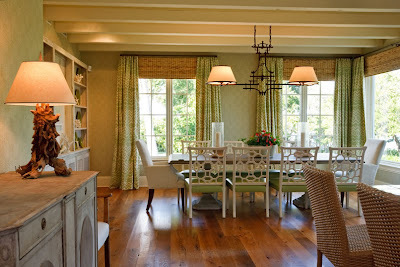 for more information on Westbrook Interiors. "Okay, seriously . . . "
I should know better than to peruse through the New York Times while I'm busy at the office . . . lol. Especially the "Home" section! How amazing is this property south on London? The charming townhouse sits in one corner of the former Holloway Sanitorium Building constructed in 1877 located next to Virginia Park in Surrey. I just love a re-purposed building. 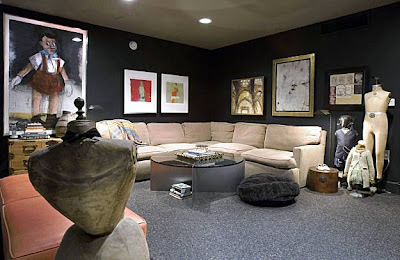 From sanitorium to chic living space. The second floor drawing room. The ground floor dining room opens directly onto the gardens. “The house did require a great deal of work, which began in June 2005, but we managed to finish just in time to celebrate Thanksgiving in our new home,” Mrs. Schick said. "The kitchen, which measures 19 by 9 feet, was also remodeled to take advantage of its large windows and to add some storage space and even a hidden table, which pulls down from a cupboard to resemble a stand-alone piece of antique furniture." and . . . done. The original dining from the facility has been converted into a pool for all the residents of the building. And bless them, they kept the original ceiling. lovely. The view over the crenelations to the neighbourhood and the gardens. Now, back to my 'slightly crazed' office. and the inevitable budget crunching. for the complete NY Times article. for the complete slideshow of the project. "Things that make you say . . . "
" . . . ahhhhhh "
Today is going to be another slightly over-booked day with client meetings, lunch dates, and some budget crunching on a new project. But, I know I need inspiration each and every day. 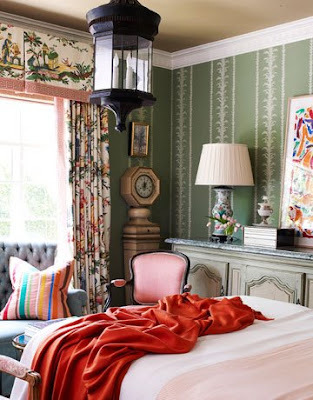 So today, let us take a short break from our hectic schedules - and feel the great calm and gracious spirit of the beautiful rooms designed by Phoebe Howard. for more information on Phoebe Howard. ps. and a huge 'thank you' to Ivan over at Meade Design Group for my cool new header. Yay! 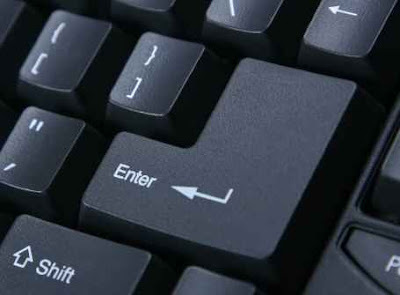 "Press Enter . . . "
I hope like many of you, I had the great delight of watching "Julie & Julia" this weekend. And I wonder how many of my fellow bloggers had chills of recognition watching Julie publish her first blog post. In the middle of a dark night. Lit only by a bright task lamp. "Press enter to publish." Wondering if it would have any impact. Or any readers. "Press enter to publish." The music swells. "Press enter." In the darkened theater, I think I may have even cried a bit - lol. 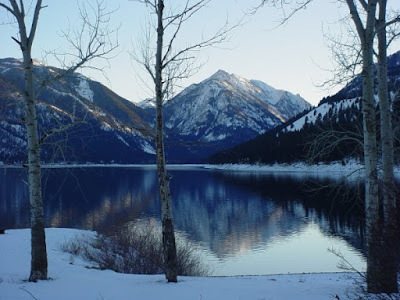 I remember the night that I published the first entry on my blog. I had been to a seminar on adapting your design business in the current economy and one of the speaker's first questions was, "How many of you have a blog?" I think two hands went up. And neither of them were mine - I only knew 'blogging' from reading "The Sartorialist" everyday. But, I did some research - it was shocking to see how vibrant the design blogging community was. So I registered with blogspot. And wrote a post. And 'saved' it. And re-wrote it the next day. And 'saved' it again - my hand sliding over the 'enter' button, but too unsure to press it. "Press enter to publish." And, of course, I remember the first time that someone that I didn't know left a comment. There was a significant amount of giggling. And now I have new friends circling the globe. And new ones almost everyday. So this brief missive functions to document my evolution to this point - but, more importantly, to say 'hi' to you fine folks out there. Those that I see in my day to day life. Those of you who leave comments that I've never met. Those of you who read. Those of you who enjoy. Those of you in 'the business.' Those of you who find inspiration. Those of you who inspire me. "The weekend getaway . . . "
Masculine and elegant. Simple and luxurious. Black and white. Mark Badgley and James Mischka. How much do I love this wonderful residence? Incredibly chic, yet still perfectly functional. 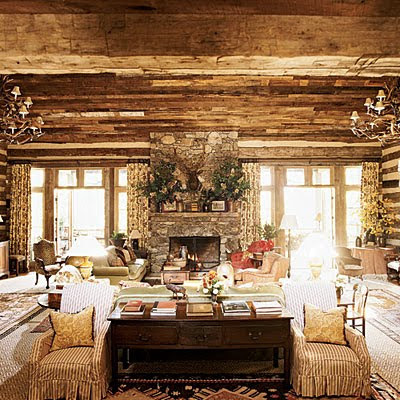 The duo behind Badgley Mischka has created this flawless retreat for themselves in the rolling hills of Kentucky - featured in the current edition of Elle Decor. 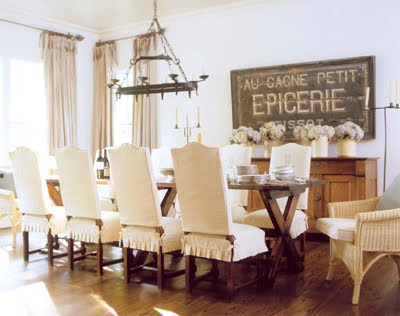 Maybe some antique Windsor chairs and Hermes table service for a quiet dinner in the library? Outdoor seating - simple and comfy - and available from Restoration Hardware. Nice. 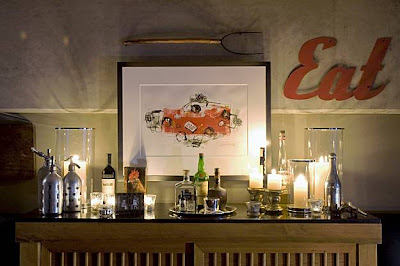 for the complete elle decor article. for more information on Badgley Mischka. "Oooo, Bright and Shiny . . . "
I can't begin to imagine trying to keep this place clean and fingerprint free . . . but, damn, it is just wonderfully dramatic. The charm of the bathing nook. The beautiful lighting. The Carrara marble. Enumerable square feet of mirror. And the huge skylight bathing the space with light. 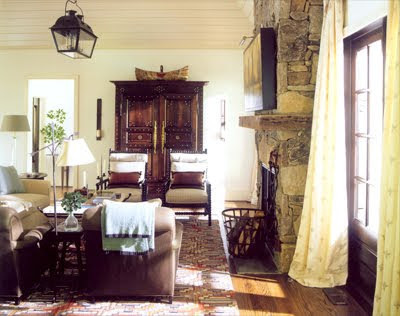 article from California Home and Design. for more information on Antonio Martins. I, like so many of you, get so excited when my copy of House Beautiful shows up at the door, and my clear favourite is the small Los Angeles home of Joe Nye. Such wonderful colours. Such beautiful details. Such amazing textiles. Such a playful sense of scale and proportion. "You practically have to walk sideways to get around. But I live alone, so 'sensible' doesn't have to prevail." Seriously, how charming and wonderful. 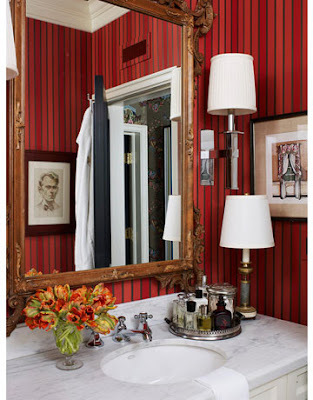 Love the paper, love the mirror, and I love the glimpse of chinoiserie wall covering through the opened door. "Since the apartment only has one bathroom, it also has to function as the powder room, so Nye wanted it to be 'slightly dramatic, and as elegant as possible.' "
And, anyone with a collection of tartanware boxes nestled in their bedroom is CLEARLY going to be a-okay in my book. lol. for more information on Joe Nye. 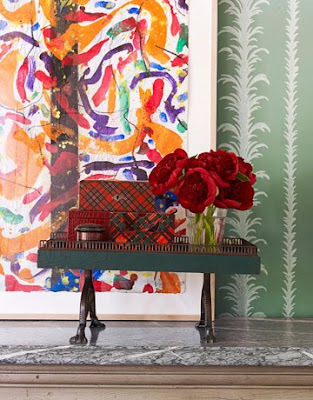 for more from House Beautiful. "114 Days and Counting . . . "